The recent death of Ronald Searle and the 100th birthday of the late Charles Addams got me thinking about how much The New Yorker has influenced me as a cartoonist. During my sophomore year of college my brother brought a stack of back issues to our apartment. I'd never opened the magazine before, but I quickly became obsessed with it - especially the cartoons. To someone raised almost exclusively on newspaper comic strips, the humor was understated and often weird. The drawings were especially appealing - the best cartoonists had a unique style that couldn't be mistaken for anyone else. I remember puzzling over a full-page spread drawn by Roz Chast, probably in the yearly cartoon issue. At first I couldn't decide whether I hated it or was just mildly annoyed by it. It grew on me, though. A few months later, she was my favorite cartoonist. The comic I posted above is from mid 2010, but it was directly inspired by old New Yorker cartoon collections. 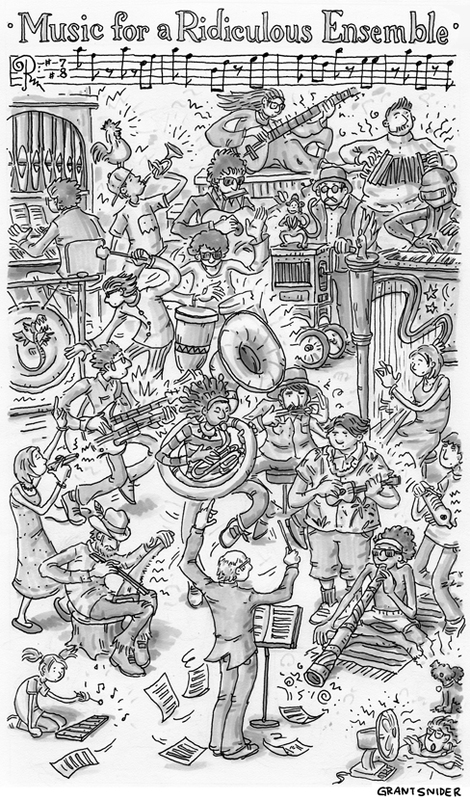 I loved the highly-detailed drawings of full orchestras, rendered in gray ink washes. I was also listening to a lot of Steve Reich at the time, and I wanted to merge the lush experimental sound of a Reich piece with the visual gags of a New Yorker panel. I'm still happy with the way it turned out. thanks for the link to the interview! Oh goodness, I love this. My brain could enjoy a lovely 5 minutes, easily (probably more) with this one. Thank you for your creations. They're always something I look forward to seeing. the saw appears to be being played backwards. Thought the bow was applied to the straight side. The toothed side would cut the bow. Anonymous: Dang, you've revealed my darkest secret... I've never played the musical saw, and whenever a band breaks one out on stage I run to the exit. But seriously, your comment makes sense.